My big day on my own in Chiang Mai was dedicated to attending a cooking class - the one thing I really wanted to do in Thailand. Cooking classes are touted everywhere here. Every hotel's chef will teach you how to cook her meals or you can take an organized tour and spend a day in an off-site class. Most of the classes look like a waste of time and money (especially the ones at some of the places we stayed after tasting the chef's meals). 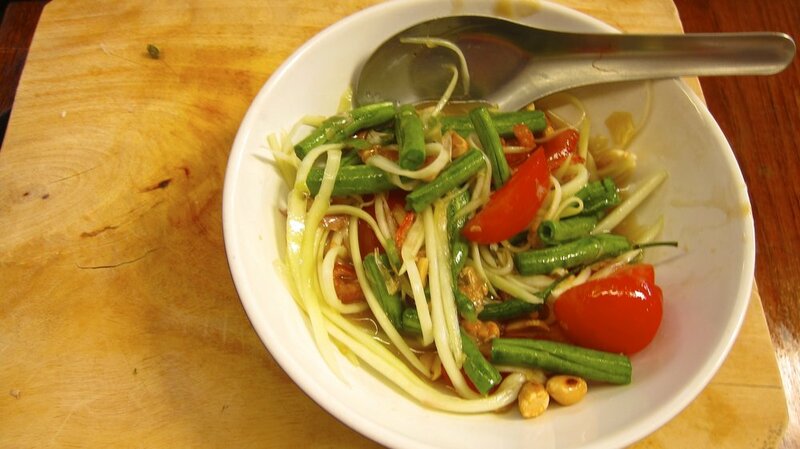 Having read a few blogs and listened to a few Thailand podcasts, I had my sights set on attending a class at A Lot of Thai cooking school in Chiang Mai. A Lot of Thai promised a small class, my own wok, knife and a day full of delicious Thai food. I knew Dave was stupid for not joining me, but I didn't say anything. I let him believe that mountain biking in Thailand was a much better idea for him that day. We all saw how that turned out. Careful not to eat any breakfast in anticipation of a full day of eating, I hopped into the baby blue VW van that pulled up at our guesthouse. Honestly, I would have been happy just driving around in that van all day with my head sticking out the window and my hair blowing in the wind. After circling around the city and picking up other students, we pulled into the driveway of A Lot of Thai's outdoor kitchen/school. Yui, our teacher, welcomed us with a smile and a laugh as she warmed up our group of seven people. A girl from San Francisco and a couple from Chicago had me feeling close to my two state-side homes while I was in such a faraway land. Our agenda for the day seemed innocent enough - two dishes in the morning, a trip to the local market, followed by four dishes in the afternoon. Each dish followed a similar pattern, we would swarm Yui's station as she demonstrated preparing and cooking the item. Our spoons would race to sample her creations knowing ours would likely not taste as incredible as hers. After a taste, we'd be sent back to our individual stations to attempt recreating her masterpiece. After minutes of scraping spatulas and clanging woks, we'd slide our meals into our bowls and head to the communal table to taste our dishes. 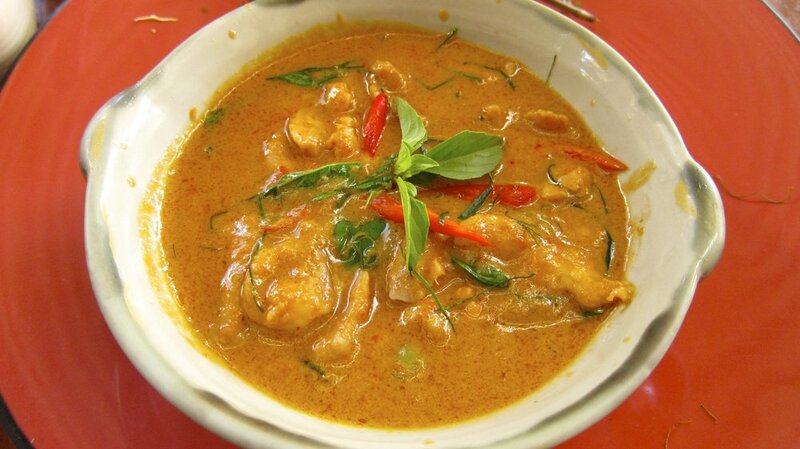 Mine never tasted as great as Yui's, but I tried my best and LOVED learning more about Thai cooking, especially how easy an intimidating curry can be. Yui was a fantastic teacher and her love and passion for both food and cooking was apparent from the first minute the class begin. She was playful, honest and so much fun to be around. Yui admitted to not liking the dried shrimp in the Green Papaya Salad and eagerly opened a bag of snacks at the market so we could all try it. She is a foodie in every sense of the word. Enough describing…let me share my day of cooking and eating with you. All pictures are of the dishes I made! 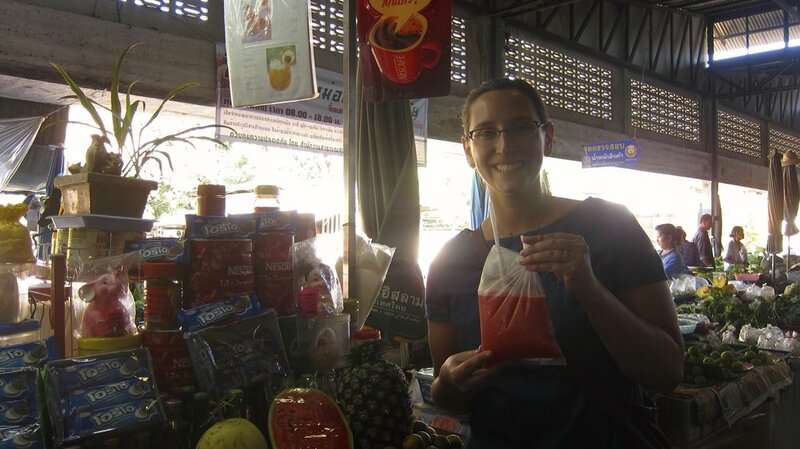 Fruit shake in a bag for 15 baht (50 cents)! PS - the secret to a good curry sauce is to taste it and make sure it's balanced with the following flavors in this order - creamy, sweet, salty, spicy. I have been studying and exploring the idea of passion for the last year and listening to Yui discuss her success as a chef and instructor all came down to her passion and love for both teaching and cooking. She embodies what it means to be open and helpful to anyone who asks for advice and says she holds no secrets. Seems like her special ingredients are the simplest - and have led her to great success. A lesson for all of us to continue learning. When I got back to our guesthouse, I found a tired and hungry husband. Lucky for him, I brought back samples of my Green Papaya Salad and Panaeng Curry. His day turned out okay. If you are in Chiang Mai, absolutely take this class. It fills up quickly so make plans in advance and select the day/course you are interested in before registering. One proud Panaeng Curry chef!